Ultan Dillane and Niyi Adeolokun are also included for next week’s game at Twickenham. Aki has been given permission to play by Joe Schmidt. 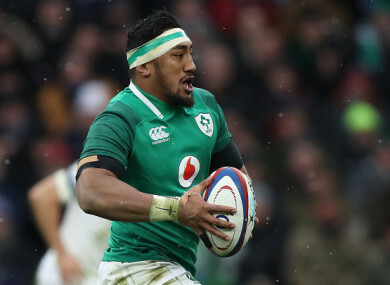 BUNDEE AKI HAS been granted permission to line out for the Barbarians in their annual clash with England at Twickenham, with the Connacht centre named to captain the invitational side. Aki hasn’t played since the province’s Pro14 victory over Leinster on the last day of the regular season and will get valuable minutes under his belt on Sunday 27 May [KO 3pm, Sky Sports] ahead of Ireland’s summer tour of Australia. The Ireland international, who was part of Joe Schmidt’s Grand Slam-winning side, has been asked to captain the Barbarians by coach Pat Lam, with whom he worked with at Connacht before Lam’s departure for Bristol last summer. “I’d like to thank Ireland head coach Joe Schmidt for making Bundee Aki available to us as he’ll be a big asset for the Barbarians,” Lam said. “The big thing about Bundee is that he’s an unbelievable competitor. A lot of the Pacific Island boys have that X-factor but he loves putting his head in the dark places and thriving in turnover and contact work. “He’s a huge leader on the field and he has a great understanding and passion for the way I like the team to play. Aki was named the supporters’ player of the year at the Rugby Players Ireland annual awards dinner on Wednesday evening and will be joined in the Barbarians squad by a number of familiar faces. Connacht winger Niyi Adeolokun is among the backs named in the Baa-Baas panel, as well as USA out-half AJ MacGinty, Ulster’s departing fullback Charles Piutau, former All Black Luke McAlister and Scottish scrum-half Greig Laidlaw. There is further Irish representation in the forwards with Ultan Dillane included, while the likes of John Afoa, Justin Tipuric, Victor Vito and Sateki Timani add experience and international quality to the pack. The Barbarians have faced England 16 times in their history and are looking for their first win in the fixture since a 39-29 victory back in 2014. The game will serve as a warm-up for England’s summer tour of South Africa, with Eddie Jones’ side getting their three-game series against Rassie Erasmus’ Boks in Johannesburg on 9 June. Email “Bundee Aki to captain Pat Lam's Barbarians against England ”. Feedback on “Bundee Aki to captain Pat Lam's Barbarians against England ”.